Central Vacuums : Select Audio & Video Inc. Select Audio & Video Inc. specializes in central vacuum systems. These systems have become a standard offering for many custom built homes. 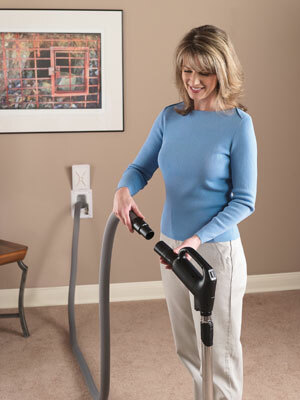 Over the years, homeowners have come to appreciate the conveniences central vacuums offer. Most home owners are unaware of the positive effect on indoor air quality that central vacuums can provide. The American Lung Association’s ongoing Health House educational and demonstration program offers a set of building criteria developed with climate specific construction and product category guidelines, for constructing a healthy house. Whole house vacuums are included on its list of required products because they capture dust, dirt, and allergens without stirring up microscopic particles. Central vacuums are a more powerful method of cleaning the home. They have three to five times the power of a traditional portable vacuum. One-hundred percent of what's picked up does not recirculate back into the living area. Manufacturers claim that the combined cleaning and convenience aspects of central vacuums benefit not just homeowners with allergies, but anyone who wants a cleaner home environment and doesn't want to lug around a heavy appliance. Everybody can benefit, because of the ease of being able to store the wand and hose and being able to take it out whenever you need it instead of having to run up and down stairs with your upright or canister vacuum. Additionally, central vacuum systems typically outlast the lifespan of conventional vacuum cleaners by several years. With proper maintenance there is no limit to how long the system can last.